A group of Russians organized on this night a Halloween Ball. When the All Night Vigil celebrated to St. John of Kronstadt began, many people were absent, to the great sorrow of Vladyka. After the service, St. John went to the place where the ball was being held. He entered the hall and the music stopped as Vladyka, in absolute silence, glared at the people, and with his staff in hand, he slowly walked around the entire hall. A group of Russians organized on this night a Halloween Ball. When the All Night Vigil celebrated to St. John of Kronstadt began, many people were absent, to the great sorrow of Vladyka. After the service, St. John went to the place where the ball was being held. He entered the hall and the music stopped as Vladyka, in absolute silence, glared at the people, and with his staff in hand, he slowly walked around the entire hall. He didn’t speak, but the sight of Vladyka brought general consternation to the party. Vladyka left but the next day in church he called all to the devout Christian life. 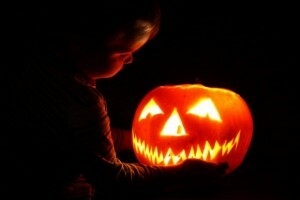 In some ways, talking to an Orthodox group about Halloween is like what we use to call “preaching to the choir.” In other words, non-participation in Halloween should be a “no-brainer.” Yet, I believe that the issue of Halloween is an example of a more fundamental struggle between Orthodoxy and the secular spirit of our age. What I hope to accomplish in this speech is for us to begin to understand the cause and the nature of this struggle and begin to gain some idea of how to deal with it. Many beliefs and practices were associated with this feast, which have endured to this current time. On the eve of the New Year’s festival, the Druids, who were the priests of the Celtic cult, instructed their people to extinguish all hearth fires and lights. On the evening of the festival they ignited a huge bonfire built from oak branches, which they believed to be sacred. Upon this fire, they offered burnt sacrifices of crops, animals, and even human beings to appease and cajole Samhain, the lord of Death. They also believed that Samhain, being pleased by their faithful offerings, allowed the souls of the dead to return to homes for a festal visit on this day. This belief led to the ritual practice of wandering about in the dark dressed in costumes indicating ghosts, witches, hobgoblins, fairies and demons. The living entered into fellowship and communion with their dead by this ritual act of imitation, through costume and the wandering about in the darkness, even as the souls of the dead were believed to wander. Divination was also part of this ancient Celtic festival. After the fire had died out the Druids examined the remains of the main sacrifices, hoping to foretell the coming year’s events. The Halloween festival was the proper night for sorcery, fortune telling, divination, games of chance, and Satan worship and witchcraft in the later Middle Ages. In the strictly Orthodox early Celtic Church, the holy Fathers tried to counteract this pagan new year festival that honored the Lord of Death, by establishing the Feast of All Saints on the same day. (It differs in the East, where the Feast of All Saints is celebrated on the Sunday following Pentecost). The custom of the Celtic Church was for the faithful Christians to attend a vigil service and a morning celebration of the Holy Eucharist. This custom created the term Halloween. The Old English of “All Hallow E’en”, i.e., the eve commemorating all those who were hallowed (sanctified) became Halloween. Dr. Rearick concludes with the idea that we shouldn’t abandon Halloween to the dark side of satanists and Wiccans. We should “reclaim the season” just as we did with Christmas. Therefore Halloween can be seen as a time to laugh at Satan and make fun of him and to rejoice in Christ’s victory over death and demons. The only real reason that we are reluctant to join the party is because Christianity fears the use and development of imagination. Webster defines secularism as “indifference to or rejection of religion and religious considerations.” While we may object to the hedonism and materialism of our day, these are not new to this world. There have always been those who loved pleasure more than God and who placed their material well-being above their spiritual life. What is most important here is the word “indifference,” and it draws its life from a basic an all-pervasive idea: all truth, especially religious truth, is relative. Fr. Seraphim Rose spoke of this new philosophy. He used the word “Nihilism”, and called it the basic philosophy of the 20th century. Today’s modern pagans are also “god-fearing people.” They might attend church with family, have two cars in the garage, attend or watch sporting events, etc, Concerning the religion of others, they are tolerant because “after all, there is no real difference between us.” Though a member of a denomination, the modern secular pagan is prideful of the fact that he really believes that denominations are in fact of no real consequence. To the mind of the modern secular pagan, the more absolute the claim to truth, the more irrelevant it seems to the cares and concerns of modern life. Is it any wonder then that to these modern folk, Halloween is no big deal? Such is the world in which we now live and those who claim the Orthodox Faith undertake a unique challenge. Never before have Christians lived in a society that is secular by design and intention. 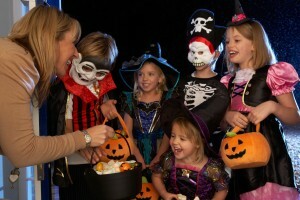 Because we do not address our worldliness we can, on a Saturday night hold a Halloween party instead of going to Vigil. It isn’t until St. John walks in our midst and looks at us with those piecing eyes that we suddenly feel the presence of that other world, the Kingdom of God, and we begin to sense our utter conformity to the world. The Lord said, “I pray not that thou shouldest take them out of the world, but that shouldest keep them from evil. They are not of the world, even as I am not of the world.” (John 17:15-16) How is it possible to accomplish this? First, we need to repent. Well, we hear this all the time in Church, but I propose that we must go deeper than just feeling sorry about the situation. The Greek word for repentance is “metanoia” which means a “change of mind.” St. Paul tells us that we should not be conformed to this world, but transformed by “the renewing of our minds.” This means that we strive to gain the mind of Christ, an Orthodox mind. Fr. Seraphim believed that modern man could not come to Christ fully until he was first aware of how much the world had changed. Instead of just criticizing the world, we must recognize the Nihilism (or secular spirit) in ourselves. “The Nihilism of our age exists in all,” he wrote, ” and those who do not, with the aid of God, choose to combat it in the name of the fullness of Being of the living God, are swallowed up in it already. Orthodox worship is not just a private matter. It is a rejection of the duality of the modern secular world – a duality that says, God is here, but He is not there. The goal of my striving is to become a sacramental man, who sees the entire universe as a place of God’s appearing. That means that family and work and leisure are not separate places apart from God. True repentance is never an easy thing to accomplish, and gaining an Orthodox mindset in this world will not be easy either. As a priest, I see my people struggling with the confusion of trying to live an Orthodox life in a today’s world. I was going to school in England when I first met the Orthodox community at Durham University. These students came from all over the Orthodox world. I met my first archimandrite there and my first archpriest. One thing I remember is that they all seemed curious about how it was possible to live as a Christian such a secular and pluralistic country as the USA. I was a Methodist then, but I had to admit that I didn’t have a ready answer. I would guess however that if trends continue as they are, and as the secularism and materialism of the West continue to conquer the East, they too might have to struggle to find an answer. God help them. Holy Orthodoxy and the Church have given us the tools to transform our minds. All are contained within Holy Tradition: attending Church, fasting, prayer, the reading of Scripture, the reading of the lives of the Saints, and the teachings of the Fathers, all these things can work to make us holy people. It isn’t enough to just possess the tools, we must actually use the tools if we are to build anything of lasting value. Often people ask me why the Orthodox Church repeats things so much. “Paci-paci”. Years ago, I made the observation that people would attend faithfully attend Church services despite the fact that they had to wash their clothes in the river, gather their food from the fields, make their own clothes, harness the horse, cook from scratch, etc. Goodness, where did they find the time to go to Church so much? Now, in this wonderful modern world, we are “blessed” with time-saving and labor-saving devices: dishwashers, clothes washers, canned and prepared foods, ready made clothes, fast cars, etc. Yet, even with this timesaving technology, it seems that we have less time for spiritual life than our predecessors. Certainly, silence has virtually disappeared from our lives. “Crowds” doesn’t simply mean a lot of people, but it means entertainment, spectacles, and diversion. We have certainly have an abundance of it in this country. I could speak at length upon each of these, but I want to deal mainly with the issue of hurry. To enjoy the fruits of repentance, we must deal with the issues of priority and time. This is what “hurry” is all about. The pace of life has quickened, and this why, even with our technology, we have less time than before. Listen, I know we are tired, I know that our lives are full, and I know that we grow weary of hearing priests complain about why we aren’t more faithful. Perhaps, you feel that I have gone a bit far from the topic of Halloween. Possibly, but to piously say to our beloved pagans that we don’t celebrate because we are “not of this world” (i.e. Orthodox) is laughable if we are as worldly as they are. By worldly, I don’t mean that we participate in the gross sins of the flesh. But if we are also hurried, concerned with success, fretting over money, fretting over possessions, constantly seeking entertainment, constantly filling our lives with noise, putting God in a Sunday morning box, finding little place for Him in the weekday cycle of work and family – then they will see the truth – we are just as pagan as they are. Our protests about Halloween will fail to convince anyone. You see, it’s a matter or witness by word and style of living. We must witness to the truth that Jesus Christ is the Son of the only true God; that all things were made by him, and for him. Christ holds all things together and by him all things consist. He is Word of God, the source of all truth, beauty, and love. Any culture, tradition or nation, even a secular one cannot limit him. This must be our Orthodoxy, and to believe it and to witness it is to truly become a “fool for Christ.” Never has it been more foolish than it is today to be an Orthodox witness in the secular world of today. It is for this witness then that we don’t participate in Halloween. By non-participation in Halloween, we refuse to acquiesce to the greatest and most subtle trick of the Devil. In Dr. Rearick’s world, the Devil does not exist, or if he does, he is simply nothing more than something to laugh at. Modern media has made horror fun. Video games desensitized the mind by making images of evil commonplace and part of our playtime. This is similar to what Fr. Seraphim Rose wrote about in his book, Orthodoxy and the Religion of the Future. Fr. Rose believed that if you took the entire psychic phenomenon – from something as benign as the TV series Star Trek to the “Gnostic Christianity” of psychic gurus such as Sylvia Browne – the mind of humanity is being subtly prepared to receive the guidance of “beings of higher intelligence.” These beings could be spiritual guides that channel through us, or they could be riding on UFOs. In reality, Fr. Seraphim believed, this mental conditioning is preparation for the Antichrist. Whether or not you agree, with Fr., Seraphim’s analysis, Halloween, as it is practiced rejoices in the irrelevance of spiritual evil. Today, spiritual evil is but a concept, and a dated one at that. Like all religious truth it is relative, and is thought to lie solely in the inner psychological landscape of the individual. Therefore, it is a matter of therapy and is of little importance to the cares and striving of the modern, pagan and secular world. So, I don’t participate, but with that alone, I shouldn’t congratulate myself. What is more important is that I attain to stillness and salvation. If I do, “ten thousand around me will be saved.” I doubt that loudly protesting Halloween will accomplish as much.